I love summer and all that comes with it. While I have always loved summer, my move to the Northeast has firmly solidified my affection. For me, summer feels all too fleeting as I never tire of the sun, warmth, and beach (spoken like a true Floridian). It’s nearing the end of July and while my daughter doesn’t start school until after Labor Day, filling the calendar with activities, projects, and plans for the fall is already in full swing. All the while I wish it could all slow down. Life, it seems to me, is quite often focused on the next thing. The next season, the next activity, the next, the next, the next. Quiet time. A whole hour set aside to quiet the mind, hopefully take a small nap, and to reset before resuming the frenetic pace of life. Children are expected to take a quiet time, but adults rarely do and instead use this time to get even more done. My entire life has been spent observing or working in the world of senior home care, because of this my mind can’t help by think of the busy, tired, and worn out caregivers who never slow down. Those dedicated souls who care for senior loved ones while working, caring for their own families, and letting personal needs slip through the cracks. How do we break the cycle of busyness? 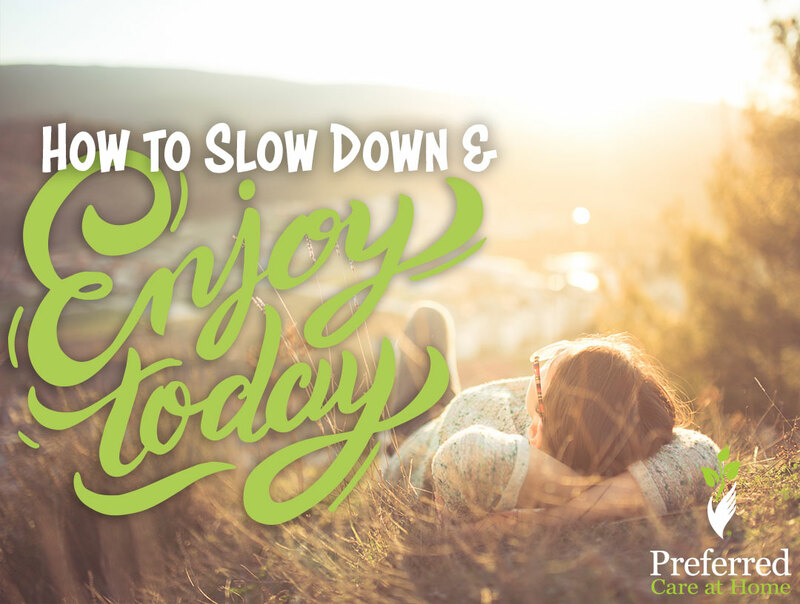 How do we slow down and enjoy today? Take a quiet time. You are not never too old to take a quiet time. An intentional 20 minutes to lay down, slow down, and regroup. Put away the phone and quiet your mind for as little as 20 minutes. Look for the joy in every circumstance. Your day may be filled with a whole lot of activities that you do not enjoy. Maybe it’s errands, cleaning, or just too many tasks. Whatever your day is filled with, search for the joy in each situation. Prioritize and eliminate activities. Motherhood has taught me that I cannot do it all. Instead, I have to intentionally look at my calendar and plan it in a way that allows me to enjoy the moments. Often that means removing activities and saying, “no” to certain requests. If I’m over-scheduled or stressed enjoying the small moments are much more difficult. Ask for help. Perhaps the most difficult tip is asking for help. Asking for help is not a sign of weakness, in fact, recognizing our need frees us to enjoy each day more fully. Asking for help does not make you a burden to others. The truth is when we invite people into our day-to-day struggles both sides of the relationship benefit, but we must ask so our needs are known.